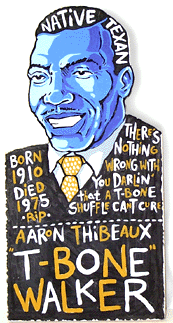 Aaron Thibeaux "T-Bone" Walker (May 28, 1910 – March 16, 1975) was a critically acclaimed American blues guitarist, singer, songwriter and multi-instrumentalist, who was one of the most influential pioneers and innovators of the jump blues and electric blues sound. In 2003, Rolling Stone magazine ranked him at #47 on their list of "The 100 Greatest Guitarists of All Time". On Rolling Stone′s 2011 list of "The 100 Greatest Guitarists of All Time" Walker had dropped to #67. Watch T-Bone Walker live with "Stormy Monday"